This section contains articles, testimonials and case studies on the power of Alchemical Hypnosis to heal disease. 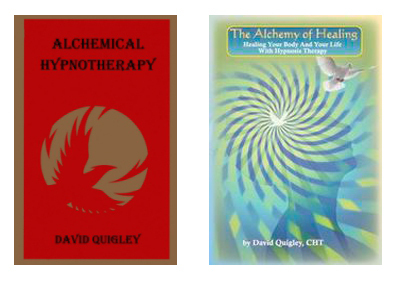 David Quigley offers an in-depth look into the treatment of disease and how hypnosis offers a powerful tool that can activate the healing power of the subconscious mind as an adjunct to medical treatment. An overview of Alchemical Hypnotherapy by Abhita Foss, Clinical Hypnotherapist. David Quigley discusses how our core beliefs, often carried over from childhood and even past lives, have an enormous impact on our health - and the power of hypnosis to reverse it. Judy Chang Gummelt is a psychologist and hypnotherapist with a private practice in Manhattan. In this article she describes How her Alchemical training completely transformed her work and taught her how to articulate and put in practice her intuitive healing knowledge. David Quigley relates his personal healing from a life long hearing impairment. In conjunction with medical treatment, hypnosis offers a very powerful means to unlock the subconscious roots for diabetes and help the body boost its own ability to manage that very dangerous epidemic. Ruth Schrader-Grace shares her experience healing a brain lesion using hypnosis as the only means of therapy. Agnés Cartry CCHT, describes healing her very serious heart condition using "inner journeys" to repair the damage. In this article, David Quigley describes the power of hypnosis in the operating room as an addition or substitute for chemical anesthesia. David Quigley describes how Hypnosis can teach you to tap into the body's own "self-therapy" in order to recover movement and flexibility in the joints. In addition, a testimonial by Kristy Thompson, a client of Alchemical Hypnosis, describes how she was taught to heal herself of Arthritis using Alchemical Hypnosis. Dr. Timothy Van Ert MD, has an holistically orientated medical practice. He completed the Alchemical Hypnotherapy Training in San Anselmo, California. Dr. Van Ert says: "Unless the doctor's work is supported by the subconscious mind of the client, a battle ensues. When medicine is supported by inner work, it stands a far greater chance to succeed".